You’re looking through old photos of yourself from a generation ago -- back when your tummy was flat and your hair was not. Those were the days when you got your aerobic exercise with the help of fitness gurus Suzanne Somers and Jane Fonda. If you want to go back to class but dropped out of the gym routine a while ago, be aware there are a couple of caveats. First of all, your body may need some prep work to avoid incurring injuries from new movements. And second, you’re not back in junior high, so you may want to ditch the “Flashdance” leotard if you want to make new friends in class. As insignificant as your wardrobe may seem, it can get you sidelined with injuries from spinning, says an article in Fitness Magazine. Tight-fitting pants and tops are the most appropriate for a spin class because you don’t want anything to get caught on the machine or detract from your form. "Though most bikes are designed so fabric cannot get caught in the crank arm, it's annoying to have clothes flailing around while you are riding to the rhythm," Marion Roaman, general manager of Peloton Cycle says. "Not to mention, cycling is such a sweaty workout -- the last thing you want is extra fabric hanging from your body." Wearing improper shoes can affect your spine. Your feet need to be clipped in securely, so cycling shoes are your best bet for a secure fit that keeps the sole in rigid alignment with the bike pedals. If your feet aren’t flat, but your toes point downward, it can increase the tension in your lower back. Make them level by pressing your heels down. Another thing you need to learn as a newbie is how to set up your bike properly. If the seat is too low, you could wake up with sore hips and knees because there’s too little range of motion with each pedal stroke. Set your seat to the height of your hip bone when you stand next to it. That should ensure the healthiest stance so that, at the bottom of your downward pedal stroke, your foot should be flat and your knee slightly bent. Proper setup also includes handlebar placement. Inexperienced spinners tend to set their seats too far back so they are lunging forward to reach the handlebars. This makes you bounce too much and can make you round your back. Sit on the bike and be sure you’re close enough to comfortably grip the handlebars. You’re too close if you feel squeezed between the seat and the bars. One of the most popular moves is called “tapping back,” which involves pushing your hips backwards. When the instructor calls for this, be sure to keep your elbows close to your sides with a slight bend so your shoulders don’t get saddled with added tension. You can party like it’s 1985 while spinning, but don’t sway too much from side to side. Your body’s imbalance may cause you to grip the handlebars too tightly, which can also cause injuries. The “Today Show” website has an article about Zumba injuries, which are sidelining participants at an increasing rate. "There's so much side-to-side movement that you really need to synchronize your hips, your knees, your feet and your ankles so they're going in the same direction," says neurologist Orly Avitzur, MD, a Consumer Reports medical adviser. "If you move in one direction and the joint doesn't go with you in that direction, it's a setup for injury." A survey was emailed to Zumba students by the American Academy of Orthopaedic Surgeons, who claim a rise in patients with ankle sprains, ankle fractures, torn meniscus, overuse injuries, and more. Rochester, N.Y., orthopedic surgeon Stephanie Siegrist, MD says she sees about two patients a week with injuries from Zumba. New participants are most susceptible, Dr. Avitzur says, in part because it’s popular with older adults. Individuals who have little experience with a lifestyle of exercise try it for fun. And when people are out of shape, they can’t keep up with their friends in the class, so they can overdo it. The kickboxing classes you find at the local gym aren’t the same as the competitive, full-contact martial arts practice, but they do involve kicking and punching from a standing position. The Podiatry Network has an article describing the range of kickboxing injuries that can result. Some of the most common podiatric injuries are plantar fasciitis, Achilles tendonitis, sesamoiditis, ankle sprains. Plantar fasciitis can occur during kicks from excessive pivoting and elevation of the foot. A front or roundhouse kick causes you to pivot on the ball of your grounded foot while your other leg is in the air, which strains the fascia. But even your striking leg can get an injury from repetitive pushing and tightening of the fascia during the kick. You’ll experience pain on the inside and bottom of the heel if you incur this type of injury. Another common injury associated with kickboxing is Achilles tendonitis. Most of the kicks engage your Achilles tendon and a typical training session can involve more than 500 such moves, so overuse is prevalent. Other kickboxing injuries are also caused by repetitive motion, such as sesamoiditis, which is inflammation of the sesamoid bones and surrounding tissues. When you kick properly, the support of your weight is on the metatarsal heads of your foot, which enables it to pivot. There are two small, round-shaped bones underneath the long bone behind your big toe, which can become inflamed from the pressure, which results in pain from sesamoiditis. Because so many positions place excess weight on a supporting limb, ankle sprains can also plague kickboxing practitioners. Adequate stretching is strongly recommended by the Podiatry Network to minimize the possibility of tendon and muscle strains. Spend at least 15 minutes stretching before punching and kicking exercises begin. If injuries are acute, such as digital or metatarsal fractures, symptoms may include bruises, swelling or inability to put weight on your foot. Your chiropractor can diagnose the severity of your injury, which you want to do sooner rather than later because you’ll have a longer absence from classes if your condition is aggravated. The best plan is to minimize the chance of injuries altogether, which you do through good preparation. 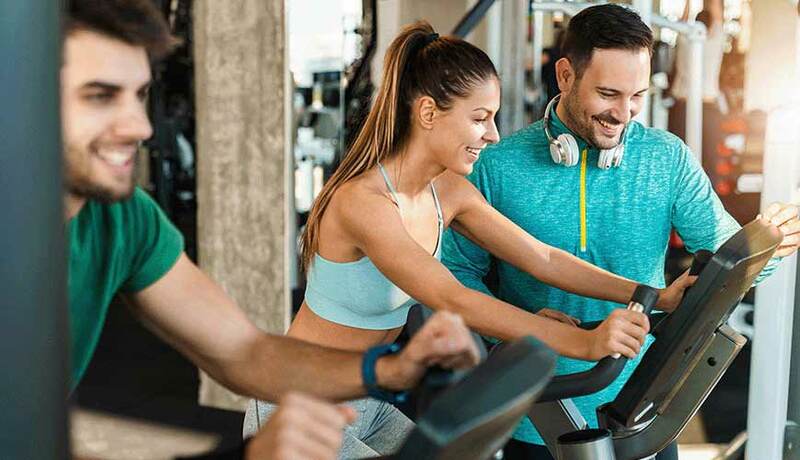 Discuss the idea of returning to the gym with your chiropractor, who can suggest exercises and stretching techniques to practice before showing up for your first fitness class. Unless you fire up your VCR for some old school fitness programs, you’ll have to adapt to the new curricula. School’s always in session and you want the only thing getting between you and your fittest self to be some new gym clothes.